Unlike the Moon or Mercury, Mars is not a dry planet. Many Martian orbiter photos show flow channels that resemble dry riverbeds on Earth. It appears that many channels originated from the southern highlands and emptied into the northern lowland basins along the boundary of the two contrasting landscapes. The highlands have many small channels scattered all over the surface. At present, however, the thermodynamic (i.e., the temperature and pressure) conditions on Mars do not allow liquid water to exist. 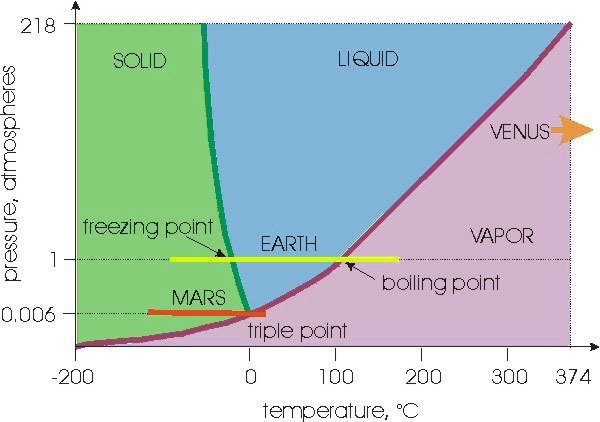 The thermodynamic condition on the Martian surface at present is illustrated in the phase diagram at left (Figure 4.1) . According to this diagram, water can only exist either in vapor or solid forms at present. There is no question that vapor and solid water do exist on Mars because they can be detected within the Martian atmosphere and in the polar ice caps. It is also possible that water may exist in solid form beneath the surface. To explain the observed flow features, one must postulate that liquid water existed some time in the past. But, when did liquid water exist? How long had it persisted on the Martian surface? Where has it gone? These are questions that have yet to be resolved.